In order to understand how the Atari does its work, we need to know how a TV set works. (If you already know all about raster scan and similar concepts, you can probably skip this part.) Go turn on a TV and look at the screen very closely. You will see a number of thin horizontal lines very closely packed together. Any picture on the TV is made up of these lines. Inside the picture tube there is a device for firing electrons at the phosphor. This device is called an electron gun and sends a continual beam of electrons in a very accurate path (see Figure 1). When the electron gun fires, an electron leaves it, travels to the phosphor, and the phosphor glows briefly where it hits. Since the gun fires a steady stream of electrons, the place the gun is aimed at glows continually while the gun is firing. The picture on your TV is composed solely of these glowing dots. At this point, we have an electron gun firing onto the phosphor of the screen. The TV picture shows one brightly glowing dot in the middle of the otherwise dark screen. If you will enter and RUN program number 1, you will get a good idea of what this looks like. In order to draw anything on the screen bigger than a small dot, other areas of the screen must also be energized by the beam. This is done with charged "deflection plates", which bend the beam of electrons, causing the glowing dot's position to move on the screen. When the dot is moved from one point to another, a line appears; this is because the beam of electrons lights the dots in between the starting and ending points on the way. These individually lit dots appear to be a solid line because they are packed so closely together. Enter and RUN program number 2 to get a line drawn on the screen. If you have a very sharp picture, you will be able to see the individual dots. However, if we trace the line just once, it will stop glowing quickly because if there aren't any electrons hitting the phosphor, it stops giving off light. 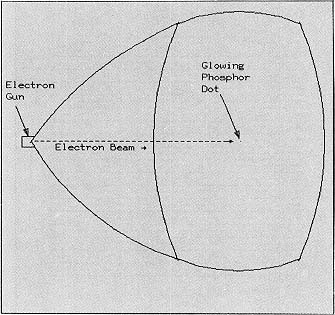 In order to display a line that does not fade, the electron beam must hit the glowing dots 30 or more times a second. At that speed, or faster, the phosphor doesn't have time to fade out before the beam energizes again. If the line isn't retraced, or "refreshed", 30 or more times per second, it will visibly begin to flicker. Any steady image you see on the TV is being continuously refreshed. The most common refresh rate is 60 times per second. If this refreshing process stops, the TV screen will quickly go blank. Television stations send information continuously to the TV, even when the screen is "frozen" (during a test pattern, for instance). An Atari continually sends signals that mean "READY" to the TV, over and over, 60 times per second when the TV displays "READY" right after you switch it on. The electron beam is moved in a standard pattern by the deflection plates. The beam starts at the top left of the screen. It scans horizontally across the top right of the screen, and shifts down one line. It then scans from left to right again. The beam does not scan from right to left. It moves back to the left hand side before scanning again and does not just scan backwards. Then the beam traces the next line down, and continues until it reaches the end of the screen. 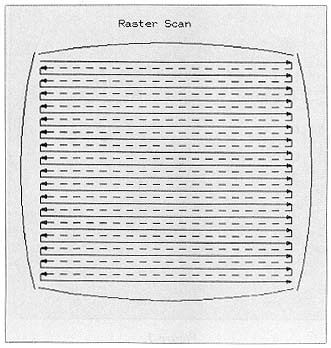 This scanning process is called "raster scan", and the lines themselves are called "scan lines" (Figure 2). When the beam is being traced in this fixed path, the electron gun's intensity is being varied. When many electrons hit the phosphor, it glows brightly, and when fewer electrons hit, the image is not as bright. By varying the intensity of the beam we can get shades of grey on the TV image. In summary, the phosphor is painted on the inside of the picture tube. Electrons fired from an electron base regulate how much the phosphor glows, allowing control of brightness levels. The TV traces a beam as a vertical stack of horizontal lines, moving from left to right. The beam is then turned off momentarily to retrace to the left edge of the screen. When the beam reaches the bottom of the screen, the beam is turned off again and the electron gun starts over at the top. Just for fun, assume that a TV screen is two feet wide and that there's 192 scan lines. Actually there are more than 192, but we will assume 192 because that is all that the Atari will allow us to use. On every refresh the electron beam traces (2 feet) x (192 scan lines), or 384 feet. Since there are 60 refreshes per second, that's 23,040 feet per second, or roughly four miles. There are 3600 seconds per hour, so a TV beam traces at 14,400 miles per hour. This is a pretty conservative estimate, too. What about color? How does that work? Color is very similar to black and white in operation. Instead of a phosphor that only produces shades of grey, the screen is split up into many small dots. Inside each dot is a place that when hit with a beam of electrons will glow one of several colors (Figure 3). The gun is aimed very precisely at these sub-dots, so that when it's signaled, for example, to show a blue dot at a particular time in the refresh, it hits the blue "subpoint" that causes that dot to glow blue. There are a finite number of dots on the screen, because each color must be represented, packed tightly, next to each other. Each dot is in a fixed position. The Atari knows the position of all the color dots, and draws graphics or characters using them. All a TV transmitter does is synchronize with the TV and then send it a continuing stream of color and brightness, or luminance information. The TV handles scanning back and forth and putting the information coming to it on screen at the right color/luminance. (Color and luminance information will be referred to as color/lum from now on.) 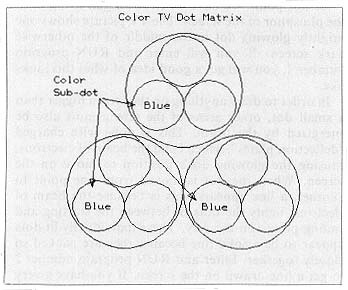 The TV station doesn't specify to the TV just where a given color/lum dot should be displayed; rather, it sends that information at the time when the TV scan will have reached the proper point. The Atari works in the same manner. An Atari needing to plot a dot at a particular point can not directly tell the TV to "put it here", and give it X and Y coordinates. Instead, it has to wait until the electron beam has reached those coordinates in its top to bottom scan, then send the TV color and luminance information for that dot. Incidentally, the Atari must immediately send information for the next dot over as well, and if the one dot is meant to stand out (as in our example) the next dot over must be dark, as set by its color and luminance information. Remember that the Atari must do all this for every lit dot on the screen sixty times per second to keep a steady TV picture. Since the Atari conforms to TV standards, it must display everything with horizontal lines composed of individual dots. This includes lines and characters; all must be composed of dots having a certain color and certain intensity. In the next section we will examine how the Atari produces characters.